The first alarm of a world oil shortage struck the United States in 1973 after members of the Arab Petroleum Exporting Countries (OPEC) established an oil embargo. It seems they were reacting to the U.S. support of the Israeli military in what is remembered as the Yom Kippur war against Egypt and Syria. That was the year Americans first became aware of just how dependent we had become to imported oil products from the Middle East. There developed an artificial shortage of gasoline and we had what I believe was our first taste of a manufactured crisis designed to sway mass public opinion. The price of gas went through the roof, we had news stories and photos of cars lined up at service stations trying to buy gasoline that was allegedly in short supply, and there was a sudden call for the nation to fix the problem we found ourselves in. --Strange machines moved through our farming area, thumping the ground and apparently searching for new sources of crude oil. Wildcat well drillers began buying up drilling rights everywhere and drilling rigs actually started drilling exploratory wells in the middle of Michigan bean fields. --Car makers quickly shifted production from the big luxury sedans with eight cylinder engines to compact cars with four cylinder motors. 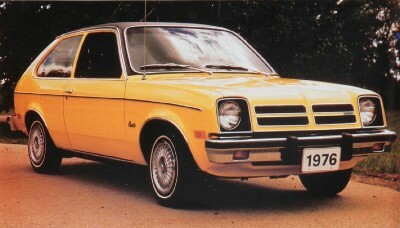 Chevrolet was among the first to produce a small car. The company chopped one end off of its successful “Iron Duke” six-cylinder engine to make a four-cylinder version to fit in its new sub-compact. --President Gerald Ford issued an executive order setting the national speed limit at 50 miles per hour. That was the most memorable change. A 50 mile per hour speed limit is painful after we were used to zipping around at speeds of 70 or higher in our big cars with powerful motors. Long trips on the nation's Interstate highways were especially bad. The police cracked down on speeders, which proved profitable for the courts. We got used to driving with one eye on the rear view mirror. The low speed limit, however, did cut the nation's gas consumption and there were fewer lives lost in traffic accidents. The news media jumped on the bandwagon and promoted the idea of a national effort to preserve fuel and cut America’s dependence on foreign oil. While caught up in this frenzy, I was persuaded to trade in our fine Plymouth station wagon that got 25 miles on a gallon of gas, for a compact Chevrolet that was so small we had a hard time getting the family packed into it. The day I walked into the Chevrolet dealership to get our new car, I vividly remember one of the service men from the back room asking why I would do such a thing as trade my wagon in for the car I was buying. He said he thought I was nuts. I quickly learned why he said that. I had fallen prey to a big industry ploy to get us to buy small cars. And I had been ripped off. The little Chevrolet was a terrible car. It only got 19 miles to the gallon. I went to various mechanics, and even tried a carburetor vapor-injection device invented by a man in the nearby town of Croswell that he claimed would increase my gas mileage. It raised my mileage up to 21 miles to a gallon. I had been better off with my station wagon. After the first winter, the salt on the Michigan roads rusted the car’s fenders so badly I took the car back to the dealer to complain. They gave me new fenders and told me I had to find a body mechanic to install them. I was so mad I drove the car across town to another car dealer and traded it in for a new full-sized Mercury which I really liked. It got very good gas mileage, and the family fit into it nicely. My lesson from all of this: Don’t trust the hucksters. Rely on your personal instincts and never fall prey to artificially generated fear systems. That fake oil crisis passed within the year, the embargo was lifted, and America went right back to buying all the crude oil it wanted from the Middle East. No oil was discovered on the land around us. The drilling derricks went away and farmers returned to growing beans and wheat. And eventually the national speed limit was lifted. Some might say the 1973 crisis was a shot across the bow. We should have started preparing for the mess we found ourselves in a few years later. The ruse worked once, the price of gasoline shot up and never went very far back down. The days of buying gasoline for twenty-five cents a gallon were over. We should have known it would all happen again. But we fell back into our materialistic ways once the storm clouds passed.